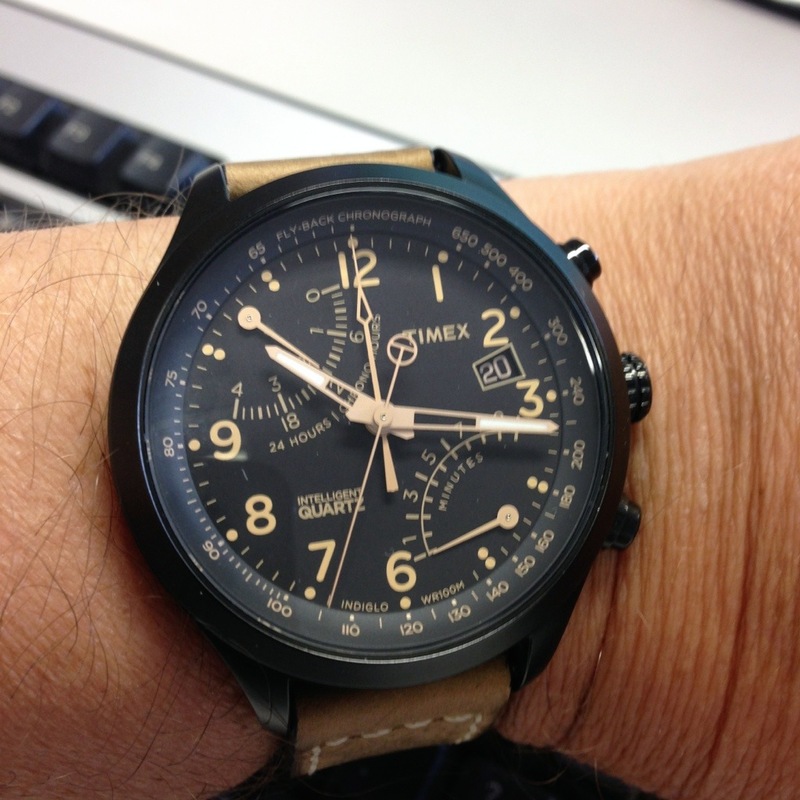 Categories: Timex, Watch Blog, Watch Brands, Wearing Today | Tags: Timex | Permalink. 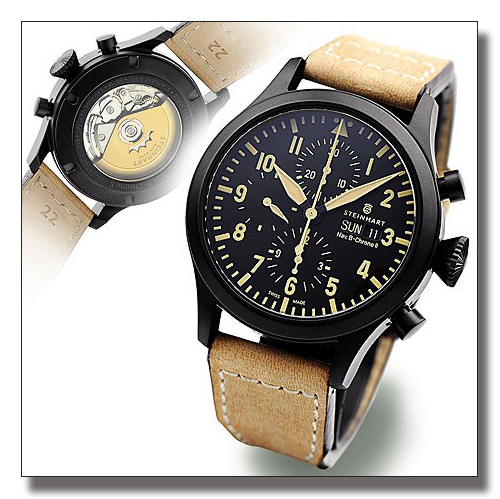 The Timex T Series™ Racing collection traditionally takes its design cues from a racing motif. The design platform has evolved but continues to deliver a bold and masculine design motif. 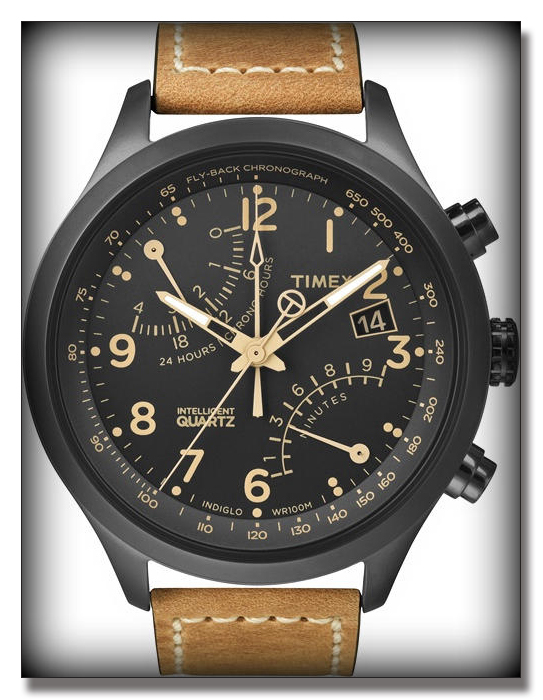 The Timex T-Series™Fly-back Chronograph with Intelligent Quartz™ technology advances the design aesthetic of this collection and features a fly-back chronograph movement and second time zone. 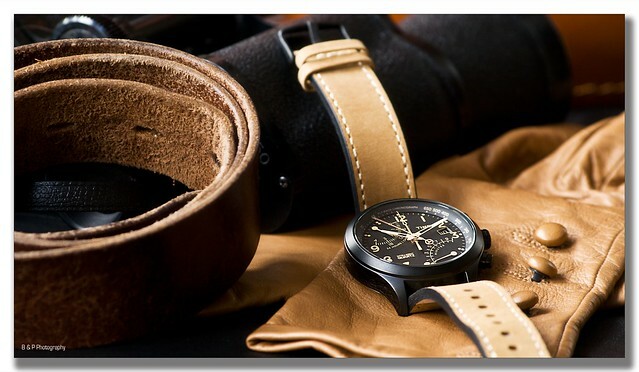 The model I have wanted for such a long time and finally have here is the T2N700 version with a black face and case and a beige vintage leather strap. 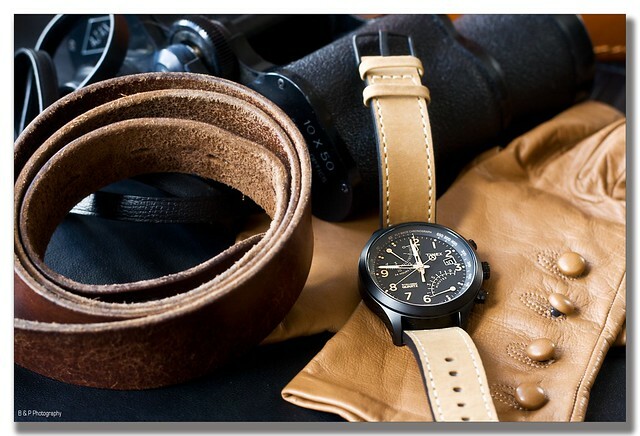 A cross then between an automobile racing chronograph and a vintage aviator! In truth the watch got off to a false start with the first releases having an incorrectly printed face and the numerals off the bottom hand running 1, 3, 6, 8, 9 instead of 1, 3, 5, 7, 9 as they should. I had to wait a while for this to be corrected and the new batch released for sale. I finally saw an example of the correct face on the Christopher Ward Forum so immediately went hunting on the Internet. 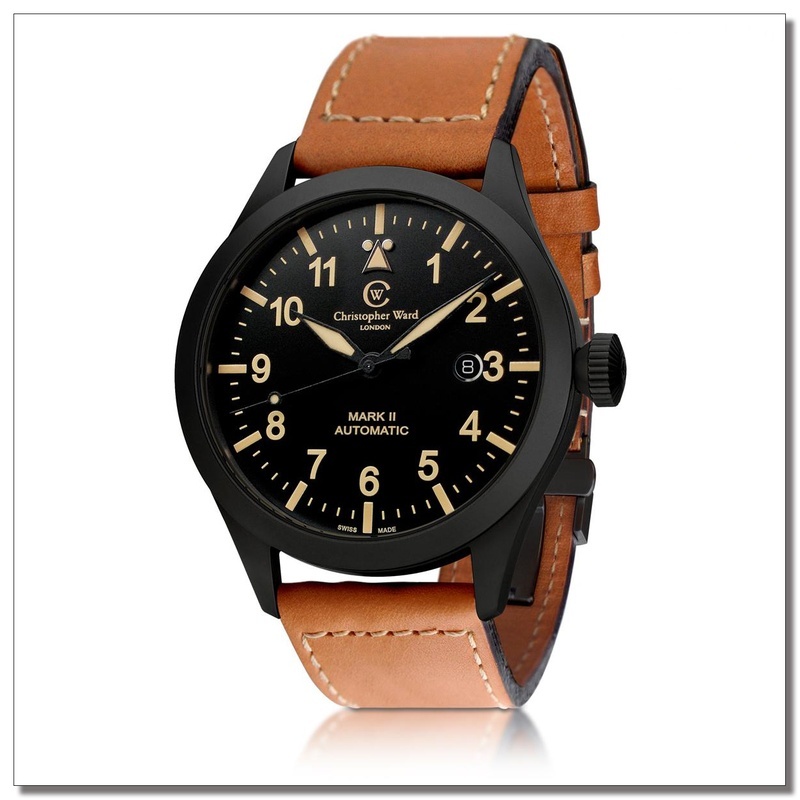 First Class Watches.co.uk came up trumps with a great price and I was able to phone them to check on the face design before placing my order. I ordered it on Saturday and the watch arrived Wednesday after the Easter Bank Holiday Monday so first class service guys! I have already written about my fondness for this vintage look when I looked at this watch along with a Bell & Ross 123 Vintage Heritage, A Christopher Ward C8 Vintage and a Steinhart Vintage Chrono. To put this in perspective, the Timex comes in at around £124, a third of the price of a CWL C8 and a lot lot less than the almost £2000 Bell & Ross. So having it on the wrist what do I think? Well at over £100 many would regard it as an expensive watch and in that market it doesn’t disappoint, good quality, good looks and great featues and I am nothing short of delighted with it. However, is the quality up there with The Steinharts or the Christopher Wards or the Bell & Ross? Simply put – no. The pushers are a tad cheap looking, The glass is mineral not crystal, the strap is chunky and acceptable but not in the same class as a Bell and Ross or a Christopher Ward. That said the strap does fit my wrist straight out of the box, which is more than can be said for a Christopher Ward C8 which comes on standard straps which are just frankly too big! The movement is quartz and not an automatic but to me that means the cheaper movement allows more investment in the glass and case and strap and from that view point the quality isn’t there. Put simply you do get what you pay for but as with most goods the more you pay the less you get for your extra money. To explain, the Christopher Ward at 4 times the price is not 4 times better, but being great value is perhaps three times better. The Steinhart at 8 times the price is also only 3 times better and the Bell & Ross at 16 times the price is probably only 5 times better. An arbitrary scale plucked from the top of my head but you get the idea. The less you pay the more you get for your money but none of us chooses the cheapest every time and especially not if you are a watch geek! In summary for the money I can’t fault it at all and it will get a lot of wrist time! 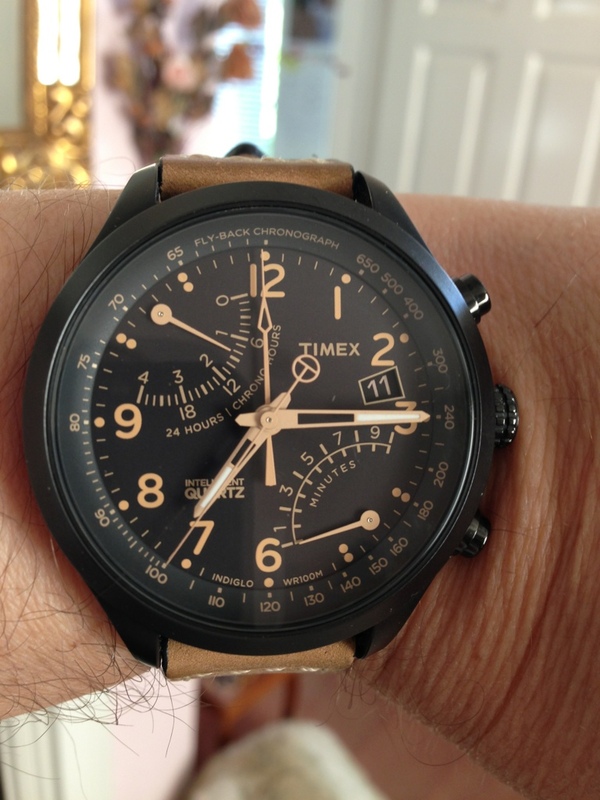 Categories: My Journey Through Time, Timex, Watch Blog | Tags: chronograph, Timex, watch, watches | Permalink. 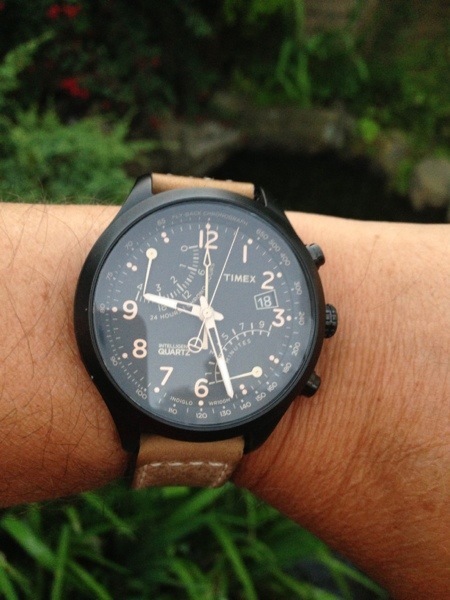 Categories: Timex, Watch Blog, Wearing Today | Tags: chronograpph, flyback, Timex, watch, watches | Permalink.